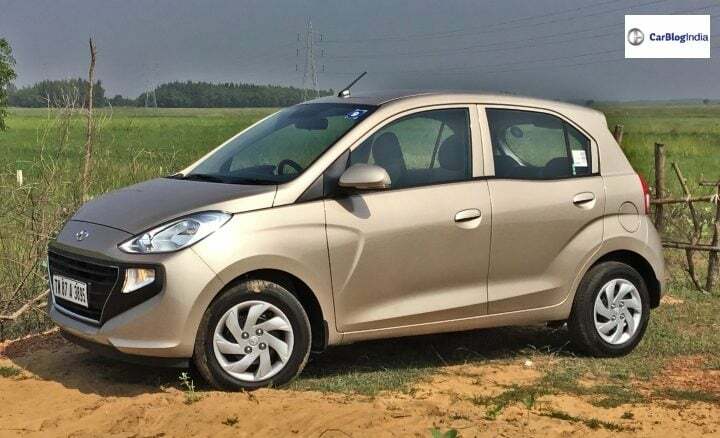 2018 Hyundai Santro is selling in huge numbers. Till now, 30,000 bookings have been done and out of that, 30% of the bookings are just for mid-spec AMT variant. The bookings for 2018 Hyundai Santro (Read More) started on 10th October. The launch was scheduled for 23rd October. As of now, the count has reached up to 30,000 bookings. Also, we learn that the first batch of the hatchback has been dispatched to dealers. The booking figures are out and as per the calculations, the mid-spec trims are the most selling ones. The lowest selling variant until now is the D-Lite model. The prices of Santro start off at Rs 3.89 Lakhs, going up to Rs 5.46 Lakhs (ex-showroom prices). Hyundai says that these are the introductory prices, which will increase after first 50,000 bookings. The most selling variants are the mid-spec trims. Mid-spec includes Magna and Sportz variant. There are 3 powertrains each available in Magna and Sportz. The list includes a petrol-manual, a CNG-petrol-manual and a petrol-AMT variant. CNG and AMT are not offered on the lower as well as higher-end Asta variant. Amongst the mid-spec trims, AMT variants of 2018 Hyundai Santro have garnered over 30% booking. Another 21% of the share goes for the CNG variants, which might increase owing to the increasing petrol prices. The biggest share is taken by petrol-manual variants of Magna and Sportz. Other trims include the base variant D-Lite, Era and Asta. These three trims are offered only in petrol-manual combo. As of now, the base variant has accounted for only 9% of the bookings. D-Lite and Era miss out on a lot of features and also are priced more than its competitors. Sportz comes with almost all the features of Asta, but Magna misses out on some important ones. The Magna variant only gets Day & Night IRVMs, Bluetooth Connectivity, USB Connectivity and Steering Mounted Audio controls from the above list. All these features only come with Magna AMT variant. For entertainment purposes, it gets a 2-DIN Integrated Audio. Reports say that the demand for Asta variant will also increase as the initial rush of bookings are done. After these introductory prices, 2018 Hyundai Santro might get a considerable price hike. As of now, the demand is increasing day by day and the waiting period is already on the rise. The estimated waiting period is around 2-3 months. 2018 Hyundai Santro comes with a 1.1 Litre Epsilon petrol engine, that comes with an optional CNG kit. The petrol engine puts out 67 BHP and 99 Nm of peak torque. For transmission, it uses a 5-speed gearbox along with an option of AMT unit. Hyundai has developed the new AMT unit in-house and Santro is the first Hyundai car to have it. It competes with the likes of Maruti WagonR, Maruti Celerio, Renault Kwid and Tata Tiago.